A Kirsty McKenzie model gives face to the photogs. It’s Thursday night at the Fermenting Cellar in the Distillery District for [FAT], the alternative fashion, music, and art week, and there’s a hint of familiarity to it—and it’s not because it’s our third day of covering the event. No, instead, we’re sensing the ghost of Buy Design, the fundraiser for Windfall that happened on Saturday in the same space. Look, there are the same giant balloons that hung as part of Buy Design’s space go-go theme. (Apparently they last for a whole month so they will be passed promiscuously along from event to event.) Look, there are faces we saw at Buy Design, like Anita Clarke of I Want I Got, Gail McInnes of The Style Box—repping some of the designers at [FAT]—fashion illustrator Danielle Meder, and designers Philip Sparks and Jessica Biffi. Let’s not forget Buy Design co-organizer and NOW fashion editor Andrew Sardone, who threw us for a second, out of his get-up from the charity event—although, honestly, we should live in Metropolis, as our facial recognition powers are thrown so easily by a pair of glasses. The biggest difference was the open bar and sumptuous food being passed around at Buy Design, while the expensive booze made us go dry for the night at [FAT]. (Next year, what’s in fashion will be flasks full of gin.) In addition, there were small vending machine–sized bags of chips selling for three dollars, but who can afford that except for the models, who’ll end up splitting a bag for dinner? Jet Exhibition models looking like snow cones. Oh, right. There were some clothes shown and you probably want to hear about those. Apparently, there were many more photogs on scene Thursday than the previous nights. They picked a good night to click, click, click: there was the collection by Magpie that had a strong Cabaret inspiration that had models slinking around in tight skirts and bustiers; Kirsty McKenzie brought out a playful collection of clingy Grace Jones–inspired jumpsuits in black bobs, except special guest Lena Love who strutted, shimmied, and sassed down the runway and merited a blue bob; Jet Exhibition had models wrapped up in what looked like watercolours done by a kindergarden class, with a feel most likely guided by WWBD (What Would Bjork Do? ); and then, there were the Salvation and Imago Zine shows. 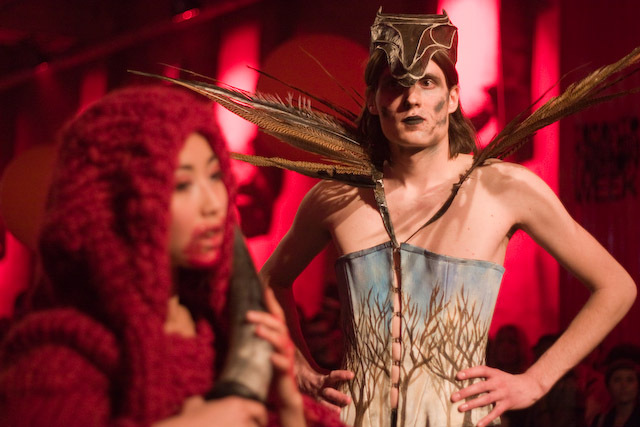 We loved the dramatics of the Salvation show, where models came out bearing weapons, like scythes and daggers, and deliciously over-the-top snarls. A list of films went through our heads as we watched the outfits come down the runway: From Dusk To Dawn, Escape From New York, even Resident Evil: Extinction. Not to take away from the clothes, since the pieces were actually kinda sensible, but the perception of post-apocalyptic has been so thoroughly sealed into our brains by films, this show demonstrates how hard it is to break free of it. Imago Zine fashions. We want that corset, but it might have to be taken out a bit. If the Salvation show reminded us of certain films, the Imago Zine show was all about the video games. Oh, there is a guy with a skull on his head and a cape. Doesn’t that remind you of a character from Final Fantasy? There’s a bloody nurse leading a bunch of zombies. Hello Silent Hill! Several of the lads that traipsed down looked like they could have played a very twinked-out Link in a heartbeat. 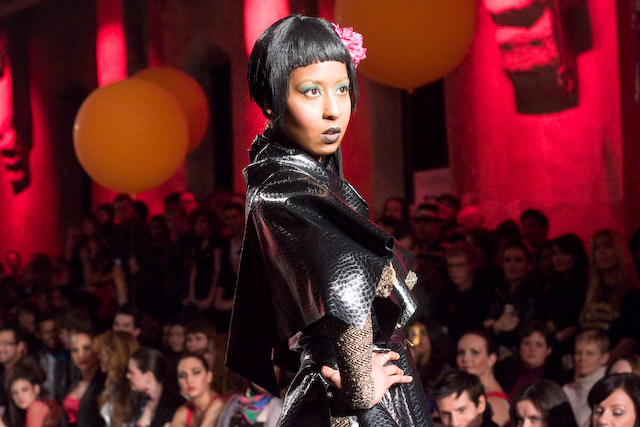 Video games have been turned into movies, why not fashion collections? Truly, the geek shall inherit the earth. After the entertaining, but long, long, long Imago Zine show, we were ready to go. We’re only sorry that we took so long making our way to Distillery and missed the first fashion set, including Breevyn McCarney, Neva, UND, and Harsh Designs. Clarke gave a hearty shout-out to the designers, but we were stuck in meetings and completely missed the 7 p.m. showtime. Real life: the true alternative and oh-so-unfashionable, no?